[I am a Senior Lecturer (Associate Professor) in the Division of Psychology at the Abertay University (Dundee, Scotland). I commenced my funded PhD in October 2010 (University of Aberdeen. Supervisor: Professor Benedict Jones). I gained my lectureship in September 2012 and was promoted to Senior Lecturer in August 2017. I have published 29 peer-reviewed papers, 5 book chapters and 1 magazine article and delivered 8 peer-reviewed conference papers, 1 invited talk and 16 conference posters. My research has attracted funding from The Carnegie Trust, The Experimental Psychology Society, Human Behavior and Evolution Society and the European Human Behavior and Evolution Association. I am Programme Leader our BSc in Psychology and Counselling (NSS 2018 = 100%). I am primarily interested in social judgements of faces and voices, in order to understand social interactions with possible romantic partners and associates. 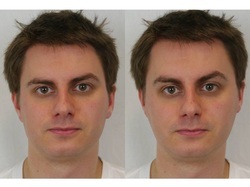 For example, my work has demonstrated that characteristics of the individual and their environment influence how they attribute dominance or attractiveness to others from facial cues. My work has attracted media attention with over 130 articles in international outlets and news media (Altmetric), including Science, APS Observer, The Atlantic, BBC, New York Post, The Times, The Australian, Hindustan Times and South China Morning Post. Prospective or current students can contact me directly if they wish to discuss potential research opportunities. Undergraduates can work in the lab via our Research Volunteer Scheme. Abertay accept applications for Research Masters degrees (MbR) and PhD (please speak to me in the first instance if you wish to work in the lab as a PG student). The Student Awards Agency for Scotland (SAAS) now provide funding toward MbR degrees.